In today’s class on the history and philosophy of science, Alex introduced us to the French philosopher Bruno Latour. 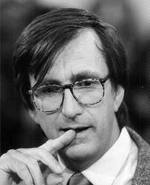 Latour is an extremely influential figure in the philosophy and sociology of science, and a leading light of the modern field of Science and Technology Studies. 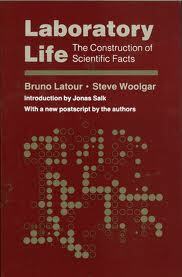 Much of today’s discussion concerned an early work of Latour, the book Laboratory Life: the Construction of Scientific Facts co-authored with Steve Woolgar. In the book, the authors undertake a study of a scientific research laboratory using the methods of anthropology. They make two major observations; first that laboratory process is deeply a process of inscription i.e. all measurements are ultimately reduced to written documents that are then durable and transportable. Hence, measurements are not debated directly but via representations such as documents and graphs. Second, Latour and Woolgar find that their observation of laboratory process does not square with the common understanding of the scientific method, in which theories stand or fall on the outcome of careful experiments. Instead, they find that an experiment typically produces only inconclusive data and that a large part of laboratory method involves taking the subjective decision of what data to keep and what to throw out. Hence, the experimental process is an elaborate mechanism for constructing facts rather than uncovering them. This idea, that ‘scientific facts’ are not uncovered in a laboratory so much as produced or constructed, led Latour to more abstract ideas of the construction of knowledge. In particular, he formulated his ideas in terms of a theory known as Actor Network Theory (ANT). ANT describes scientific facts as being constructed via a methodology that involves a network of different actors; the scientists, the equipment, the laboratory, the technicians, the subjects or samples being studied and the wider scientific community etc. In Latour’s view, any study of science methodology must involve a detailed study of all the actors involved (particularly the non-personal ones) and on their interactions and alliances; scientific knowledge is then the product of the such alliances. [A classic example of ANT is an analysis of a scientific study of scallops by Michel Callon]. What exactly does Latour actually mean by the construction of scientific facts? Clearly, some things are socially constructed; society agrees on the importance of money so it becomes important, even though dollar bills are inherently worthless (this is known as known as weak construction). It also seems reasonable to argue that knowledge is socially constructed at least to some extent; that how we ‘find things out’ is very much contingent on the actorsinvolved i.e. scientists, samples, equipment, institutions and their interaction with one another. However, Latour goes further than this; he insists that what we call scientific facts are socially constructed. In a sense, researchers transform disorderly nature into orderly artifacts; scientists produce new objects in the lab, not pre-existing ones. For example, in Latour’s view, E = mc2 is not a fact of nature; it is a constructed fact, just like a beautiful building or a Mozart symphony. Note that this constructivist view of scientific knowledge may seem at odds with scientific realism (the belief that there is a real world out there and that science reveals the deep structure of nature). However, this is not a given as Latour is talking about the acquisition of knowledge; that said, he does seem to lean towards anti-realism as we shall see later.. Laboratory Life and similar studies that followed it have been enormously influential among philosophers and sociologists of science. However, a common criticism from scientists is that it is possible that the methods of anthropology give only a superficial view of scientific work. In this view, it only seems to Latour that some data was arbitrarily rejected; in fact, it was rejected for good reasons that would only be comprehensible to someone experienced in both theory and experiment (just as an experienced car mechanic will ignore side issues and quickly home on what is wrong with an engine using a process that is clear only to other mechanics). This may seem a rather arrogant view, but it is true that it takes years to train a student to be a good experimentalist. [It’s interesting to imagine what an anthropologist with no musical training would make of a symphony orchestra; this person would make many interesting observations about the dress and social behaviour of the musicians, but could she form a good understanding of the core activity of the musicians, the group interpretation and performance of difficult music?]. On the construction of knowledge, Latour’s view has become a major lynchpin of the field of science and technology studies. It is a radical and difficult concept. Most philosophers of science agree that knowledge is socially constructed in its acquisition and pay attention to studies by Latour and others of laboratory practice as a social phenomenon. However, whether this affects the ultimate content of scientific knowledge over time is the subject of much debate (philosophers call this the difference between the ‘context of discovery’ and the ‘context of justification‘). Hence, the process by which the phenomenon of radioactivity was discovered was undoubtedly a complex social process, involving the interaction of many scientists, seemingly unrelated studies, samples, equipment and institutions, to name but a few actors. But to suggest that our current knowledge of radioactivity is entirely dictated by this process seems more problematic; and to suggest further (as Latour often seems to) that the phenomenon of radioactivity is a human construct seems very strange. For example, people died of exposure to radioactivity before anyone knew of the dangers of gamma radiation; how is this reconcilable with a view of radioactivity as a constructed fact? Indeed, Latour attracted some negative publicity over just such a claim; when French scientists declared in 1976 that tests on the mummy of Pharoah Ramses II pointed to a death by tuberculosis, Latour claimed this to be impossible because the bacillus virus was not known at the time of the ancient Egyptians! I am suppose to write a review about this book for my Ed. D assignment. It is an interesting piece of work. Do send me more reviews like this. Bruno Latour is an academic troll and waster of people’s time who quarrels with science for no apparent reason. It is not surprising at all that he is one of the stars in Alan Sokal’s celebrated book!